Possums are pretty underrated you know. Whenever people think about rodents it’s always bloody Rats and Mice taking up the limelight which just isn’t fair. I say we make a stand and shed more light on the Possums of the world. Fortunately three guys from York have felt the same way and have formed Possum, an atmospheric rock band which is responsible for the Words N Sounds EP. If you fancy a bit of music that’s moody and revels in some grunge-inspired thunder then you should probably check this out. The World Ends With You kicks off the EP with a really wonderful, uplifting collection of movie quotes that’s played on top of an instrumental that’s rife with sweet melodies and a chugging rhythm that brings forth all of the inspiration that shrines through. Quotes from Ferris Bueller’s Day Off, Rocky Balboa and It’s A Wonderful Life come and go and Possum do a fantastic job at sustaining this uplifting atmosphere and suddenly everything is happy again. Fallin’ follows with some much more original and grunge-y vocals that add some nice gravel on top of the distorted instrumental, which is once again bolstered by a steady rhythm from the drums. Possum are pretty good at creating some grooves you know, and they like to throw some hectic guitar melodies on top which sounds awesome. Like spraying silly string on top of Marvin Gaye or something. Things get much louder as Revenge Of Platypus turns out to be quite a nasty affair. 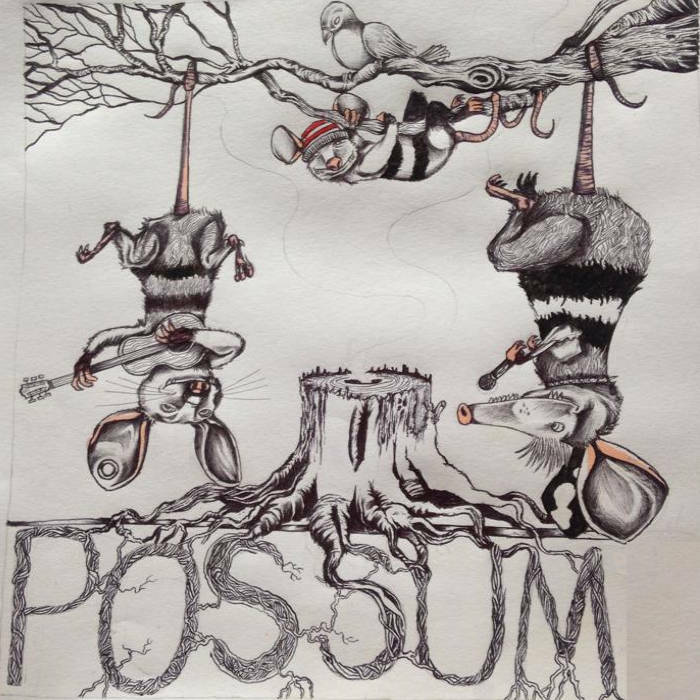 Possum allow their guitars to reach insanity levels of volume as they deliver HUGE riffs and sounds that tear all the way through the eardrums while the drums go mental and the bass creates a thick rumble beneath it all. The highlight of this track has to be the momentary breakdown which features a riff that is funky beyond belief. This Platypus has got some swing to him. Awesome track. Words N Sounds comes to a close with the seven minute epic Glass-Burn which not only sounds painful but brings forth how good Possum are at creating atmospheres. Right from the bat the trio lay down melodies that sync nicely with the vocals and the drums, before ripping with some heavy-arse power chords that brings out a whole load of emotion and passion in the vocals. It’s an awesome way to finish off an EP that has been great from start to end. Possum, I’m so very sorry I didn’t get this review out sooner but please forgive me. I very much like Words N Sounds and am certainly a fan after hearing it. Love you. Stream the EP below, and for more music reviews, free downloads and interviews check out Exploding Head Syndrome on Facebook and Twitter.